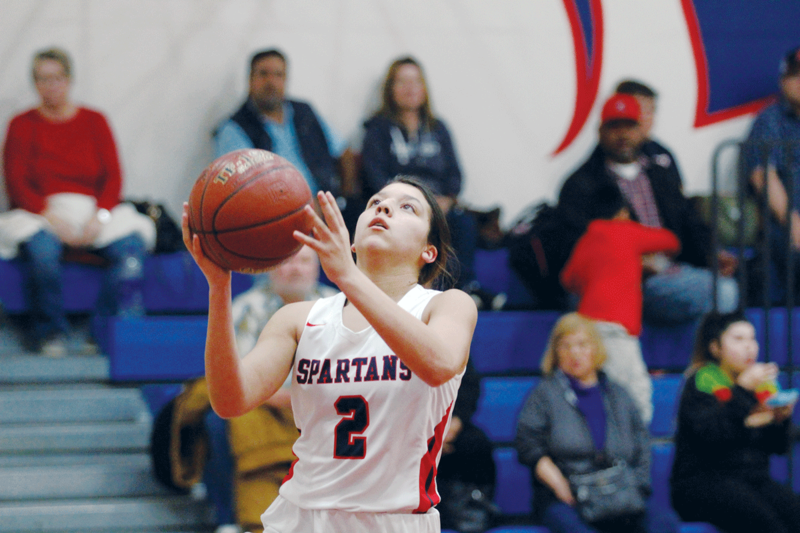 STRATHMORE – Jazmine Soto has proved she is much more than a one-year wonder as she continues to put up big numbers for the Spartans. The sophomore point-guard took a big step toward closing in on 1,500 career points by scoring 27 points last Thursday during a 68-25 rout of the Farmersville Aztecs. Soto’s current career points are 1,391 which has kept her on track to break the central sections all-time scoring record of 2,938 points set by Nikki Blue from West Bakersfield (1999-2002). Although, that record might be Soto’s end goal, barring any setbacks, it still won’t be achievable until sometime during her senior season. A record which could fall to Soto some time next season is Strathmore’s girls’ basketball school record and happens to be the county record as well. Devin Della (1993-1997) set both records by scoring 2,254 career points for the Spartans. Miranda knows that every record is within Soto’s grasp, but in order to realize these milestones there are still a couple areas of the game Soto needs to get better. During her freshman season she made a name for herself driving toward the basket, but now teams are expecting that and setting up defenses to stop her. That is why Miranda and Soto got started early last spring in improving her outside shot and free throws. “Soto has grown in that she now understands that she needs to attack the game in a different way,” Miranda said. Soto is shooting 31% from beyond the arch, and has only made 157 of 265 shots from the free throw line. Both stats are an improvement over her freshman season, but the free throw line is the one which is concerning. Her number should be up around 70 percent according to Miranda. When Soto crosses over the 2,000-point barrier she’ll be just the sixth girls basketball player in Tulare County history to do so. If she keeps up her 25 points per game average, she’ll accomplish that feat some time next season before league starts. One member on that list is ex-Cardinal standout Christina Castro (2010-2014) who scored 2,187 points. Soto’s mindset has never been solely on breaking records, but the continued success of the team (21-6). Coach Miranda is also working on Soto’s mental awareness and know when to get her teammates involved. In the first half against the Aztecs (6-17, 1-9), Soto stole the ball at half court and instead of cutting to the basket she passed the ball to Kaija Ambriz who had a better lane on the other side of the key. Her layup made the score 28-2 at the end of the first quarter. In all, seven Spartans scored with three ending the game with double digits including Erika Munoz. The freshmen made a couple crucial three-point shots in the second quarter to finish with 10 points. This is only the third time she has scored in double-digits this season. “She can shoot the ball, and right now that is her specialty,” Miranda said. Strathmore is currently in second place in the ESL, and looks to remain there entering the final week. Tonight, they host the Lindsay Cardinals at 6:30 p.m.